Don't let those precious moments slip away. 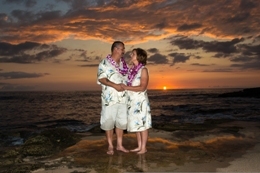 Your Hawaiian videographer will capture each second of your wedding. Every word will be recorded with our wireless microphones. You will be able to re-live the joy of your wedding over and over again and share it with your friends and loved ones who could not be there on your special day. The Heliconia package uses 1 camera for 1 hour and you receive 1 edited DVD for the cost of $495 USD. Post-wedding production and editing includes: adding titles, special effects and elimination of undesirable scenes. Want specific music? Just let us know and we can customize your video with your favorite tunes. The Hibiscus package uses 1 camera for 3 hours and you receive 2 edited DVDs for the cost of $1,275 USD. Post-wedding production and editing includes: adding titles, special effects and elimination of undesirable scenes. Want specific music? Just let us know and we can customize your video with your favorite tunes. The Hinahina package uses 2 cameras for 4 hours and you receive 2 edited DVDs for the cost of $2,185 USD. Post-wedding production and editing includes: adding titles, special effects and elimination of undesirable scenes. Want specific music? Just let us know and we can customize your video with your favorite tunes. The Anthurium package uses 2 cameras for the entire day and you receive 2 edited DVDs for the cost of $3,850 USD. Post-wedding production and editing includes: adding titles, special effects and elimination of undesirable scenes. © Copyright 2019 by Oahu Hawaii Photographer. All Rights Reserved.